Homeowners in cold-weather climates—such as the Northeast, Midwest, and mountain areas—face icy conditions, blizzards and other cold-weather storms. Beyond requiring a quick trip to the convenience store for milk and bread, severe cold weather can threaten your home’s structure and your safety. Therefore, it’s important to take measures and invest in the resources you’ll need to deal effectively with winter’s challenges before it gets into full swing. Ice storms and ice dams: Ice storms coat structures, trees, power lines, cars, roads and virtually everything else with ice. As the ice melts, large chunks can fall and cause injury to anyone below. When ice melts during the day and then re-freezes at night, ice dams—which block water from flowing in the gutter—may form. This condition can force water back under the roof line and cause leaks. Sleet or freezing rain: Combinations of snow and freezing rain may cause slippery conditions and coat roads, sidewalks and driveways with ice when temperatures drop. 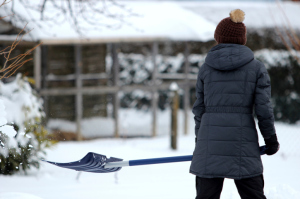 The Federal Emergency Management Agency (FEMA) recommends that home owners have shovels on hand, as well as melting agents such as rock salt. Some of the new, more environmentally friendly deicers include calcium magnesium acetate and sand to improve traction. Be sure to stock up early in the season, as these agents tend to be in short supply during periods before a well-publicized storm. FEMA also advises you have enough fuel to maintain heat in your home, as well as a backup heating source: firewood if the home has a working fireplace or a generator to power heaters in case of power failure. However, use caution as these can represent fire hazards when not used correctly. Be sure to follow directions explicitly and keep a fire extinguisher. Some generators and fireplaces also require proper ventilation, according to the Institute for Business and Home Safety—so follow directions carefully and keep them away from curtains or other flammable items. Stock up on extra blankets, warm clothing and enough food/water to sustain your family in case of a few days of isolation. And a transistor radio with fresh batteries can help keep you updated on news and information in case of a power outage. Before winter, there are some precautions you can take to protect your home from the ravages of severe cold weather storms. Winterize your home: Check shutters, siding and other exterior materials to ensure they’re secure, says retired contractor, home improvement expert and writer John Wilder of Jacksonville, FL. High winds, ice and moisture from winter storms can easily strip off such outside elements if they’re loose. Be sure that gutters are clear of debris and walkways are even—and don’t represent tripping hazards that can be exacerbated with snow or ice. Caulk drafty windows and apply weather stripping to doors, both inexpensive strategies that can keep heat in your home. Air sealing can help you save about $350 in energy costs or one-third of your average annual heating and cooling costs. The average annual home energy bill is about $2,200, according to Energy Star—of which about $1,000 represents heating and cooling. An assortment of air sealing materials and tools—including silicone foam, caulk, aluminum flashing for flues and additional insulation—will run roughly $100 to $350. Winterize pipes: Be sure your pipes, especially those exposed or in unheated areas like crawl spaces, are wrapped in insulation to prevent freezing and bursting. Also, learn where your water shut-off valves are so you can turn off the water supply in case of a leak. Six feet of insulation can cost anywhere from $7 to $17; it’s available at most home improvement stores. Trim tree branches: Branches that overhang roofs or areas where you park your car—or which are simply overgrown—represent a risk to structures, vehicles and people. Keep trees trimmed and remove those that are weak or sickly to prevent them from falling on or near your home. Tree trimming and removal pricing varies greatly, and you may have additional restrictions if you live in an historic community—or if the trees are close to power lines. Check with your municipality about any regulations and contact your local Chamber of Commerce, municipal offices or contractor rating sites like MerchantCircle.com or AngiesList.com to get the names of reputable pros. Tree trimming and removal can be dangerous, so don’t attempt it on your own unless you’re experienced.